It's hay season, and we all know you have to make hay when the sun shines - and that's no joke! Riding Lessons, Training, Shows, Trail Riding, harvesting from the garden...What isn't new on the homestead? ← Angel, our adopted wild mustang, is brand new at the Buck 'n' Mule Farm and everyone has to check her out. ​You gotta make hay when the sun shines! ​That is not just an old saying…you really do need to make hay when the sun shines. In our neck of the woods we need a nice forecast with about three straight days of sunshine for our hay to dry well enough to bale it and put it in the barn. Well, anyone who has ever been to Central New York knows that three days of sunshine in a row can be hard to come by. The weather around here literally changes by the minute. If you have horses or cattle, you need hay. 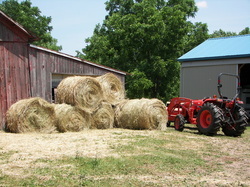 We are fortunate to have our own hay fields and cut and bale our own hay for our use. We can monitor the type of hay we grow, the quality of that hay and we know what is going on our fields -no chemicals. Hay season is stressful for anyone, whether your grow your own or have it delivered. 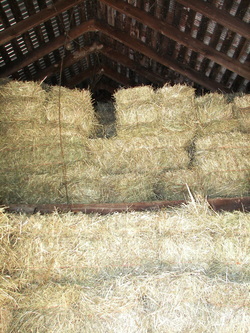 For the common at home farm, you are not usually on the top of the list for your hay delivery. All the big customers come first. So you have different worries than the farmers, like us, who cut our own. No matter who you are, if you need hay, there is no more rewarding feeling than having your barn filled to capacity with good quality hay. The sweet smell of it fills your lungs as you take a deep breath. Then you let out a sigh of relief knowing your herd will be all set with forage for the upcoming year. It truly is a sense of satisfaction. While we were at the BLM Adoption in Ithaca, NY June 17 - 18th we ran into an acquaintance that also has Scottish Highland Cattle. She has been raising hers for quite a few years, also grass fed only, like ours. 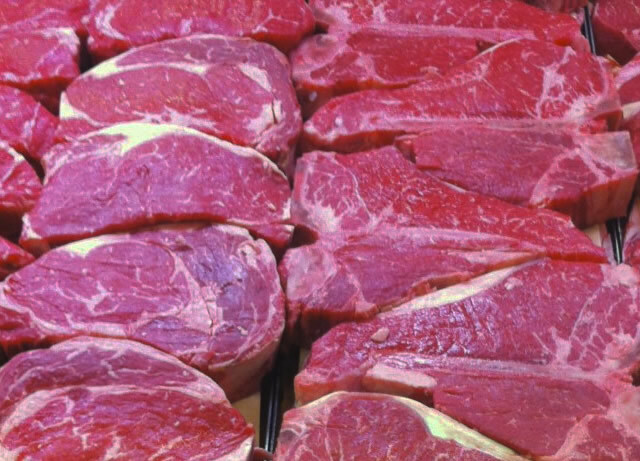 Most everything tells you, you can harvest the animal when it is 2 1/2 years old. Andrea tried that and was disappointed with the meat and the marbeling. She contacted an elderly man in Scotland who has been raising Scottish Highland Cattle for a very long time and he said the key is to wait until they are 3 years old. By then they are finished growing and that is when they start to put on some fat and the marbeling is beautiful. Findlay has had a reprieve from his destiny this fall. He will spend another winter fattening up on fresh hay until next Spring. This month's recipe isn't quite what you think. It is actually "salads" FOR your chickens! 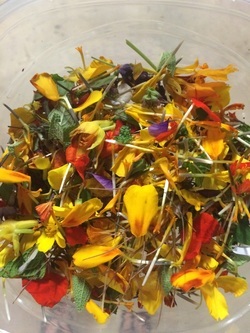 When the chicks were little, I would pull the petals off the flowers and cut the herbs with kitchen shears into bite sized pieces for them. They loved it and it was good for them. All the trimmings from my herbs go in the chicken "salad"
Now that my garden is producing and my herbs are growing nicely, it is the perfect time to start sharing with the chickens (February Issue). We eat a lot of fresh fruit and vegetables in the summer. Anything that is not what I care to put on my plate, ends up in a bucket for the chickens. Lettuce, sweet peppers, pea shuckings, tomatoes, herb trimmings, marigolds, violas, pansies, nasturtium, swiss chard, tomato plant trimmings, strawberry tops, mushy strawberries, blueberries, raspberries, the list is endless. Some herbs I grow specifically for the chickens because of the health benefits. 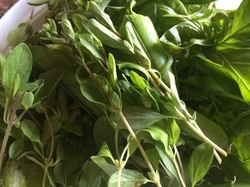 My chickens love parsley, oregano, basil, thyme, sage, fennel, cilantro, basil, to name a few. 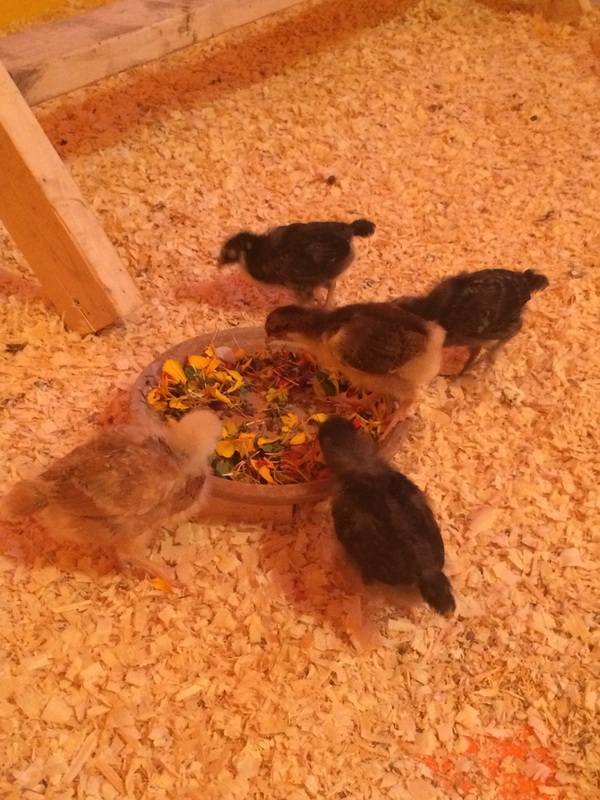 The chickens go crazy over the new “salads” they get and I waste less and save money on the natural feed I purchase at the store. It is a win-win situation. Just remember, chickens will eat most anything including meat, but they should never be given moldy food and certain types of foods should be limited or avoided. 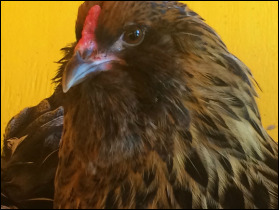 If you have chickens and you aren’t sure of a food they should eat – always do your homework first. I love my fresh vegetables from my garden. When I am cleaning my veggies, I keep a handy plastic container near the sink to put everything for the chickens in it, so as not to waste anything. I get the fresh peas and salad. They get the pea shuckin's and the wilted lettuce. Summer's are short, so we try to do as much work, and have as much play, as possible. The result is typically tired, aching, sore muscles. After a trail ride, your horse may have them too. 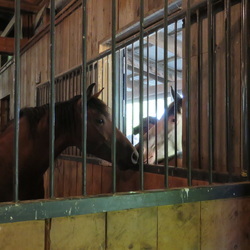 Here are some recommendations for you and your equine. 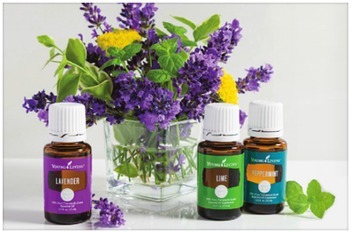 ½ - 1 C Epsom Salts & 20-30 drops of any variation of essential oils (some oils to try – Lavender, Peppermint, Wintergreen, Aroma Siez, PanAway, Majoram, Basil) add to a bucket of warm water (or your bathtub for you) for a soothing wash and rub down after a long ride. 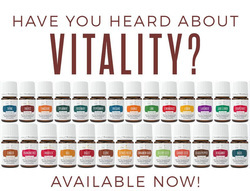 Or you can try PanAway, an essential oil blend full of muscle and joint soothing essential oils including: Wintergreen, Helichrysum, Clove and Peppermint. This is a perfect topical rub for your horse or you. PanAway should be diluted 50/50 with a carrier oil, as many of these oils are considered “hot” and my cause skin irritation when used neat (refer to February Issue for information about carrier oils and hot oils). For “ready made” massage blends specially made with all the natural essential oils beneficial for helping to soothe sore tired muscles after a long day (for your and your horse), you might also want to try Ortho Ease and Ortho Sport Massage Oils. Ortho Ease – soothes and warms tired and stressed bodies, helping to combat the damaging effects of everyday activities. With a calming blend of Young Living Therapeutic-Grade essential oils, Ortho Ease will leave you feeling relaxed and refreshed. Contains Fractionated Coconut Oil, Wintergreen, Grape Seed Oil, Peppermint, Juniper, Eucalyptus Globulus, Lemongrass, Marjoram, Thyme, Eucalyptus Radiata, Vetiver, Wheat Germ Oil, Sweet Almond Oil and Olive Fruit Oil. Ortho Sport – a stronger version of Ortho Ease. Ortho Sport Massage Oil is designed for both professional and amateur athletes, as well as anyone who works or plays hard. Ortho Sport Massage Oil has a higher phenol content, which has been used traditionally to produce a warming sensation and provide relief to tired muscles. Apply PanAway after exercise or to the neck or back anytime for a soothing and stimulating aromatic experience. Dilute with a carrier oil and apply topically on location as needed, use in a massage or a warm compress. For your equine, PanAway is a blend formula to reduce pain. The wintergreen in PanAway contains 99% methyl salicylate, which gives it a cortisone/aspirin-like property without the side effects. It is used to ease arthritis and laminitis pain, to reduce inflammation, to aid in the healing of bruised muscles, and to lesson bone, nerve and joint pain. For your dog or cat, it is the best oil blend for minor injuries. (Dilute before using on cats). Great for urinary health, aches and pains, dental extraction or minor discomfort. Use topically with a warm compress or Vita Flex points on the paws.